In the previous version of PowerCLI we had 165 great cmdlets to play with and didn’t we have fun, now in the new version (Download Here) we have a whopping…..
That’s right, an extra 68 cmdlets (4 of the old cmdlets were renamed from the previous version), bring on the fun ! So as well as the increased performance, what do we now have to play with ? here is a quick summary of the new cmdlets and what they do…. Add-PassthroughDevice Attaches pass-through devices to the specified virtual machine. Apply-DrsRecommendation Applies the specified DRS recommendations. Copy-DatastoreItem Copies items between datastores and between a datastore and a local file system provider. Copy-HardDisk Copies a virtual hard disk to another destination. Copy-VMGuestFile Copies a file from and to the guest OS of the specified virtual machines using VMware Tools. Export-VApp Exports a virtual appliance to the provided destination. Get-DrsRecommendation Retrieves the available DRS recommendations from the provided clusters. Get-IScsiHbaTarget Retrieves the available iSCSI HBA targets. Get-NicTeamingPolicy Retrieves the Nic teaming policies of the specified virtual switches and virtual port groups. Get-OSCustomizationNicMapping Retrieves the configured Nic setting mappings for the specified OS customization specification. Get-PassthroughDevice Retrieves the pass-through devices available on the specified hosts, virtual machines, and templates. Get-PowerCLIConfiguration Retrieves the vSphere PowerCLI proxy configuration and default servers policy. 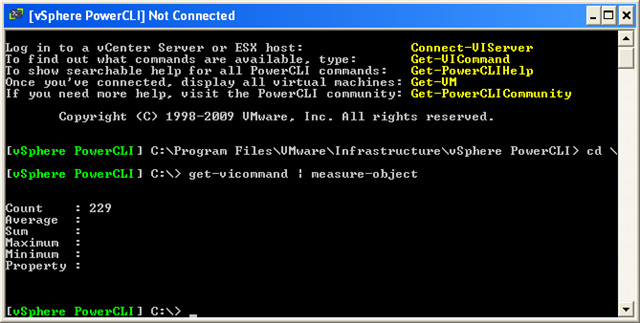 Get-PowerCLIVersion Retrieves the vSphere PowerCLI version. Get-UsbDevice Retrieves the USB devices available on a vSphere server. Get-VIPermission Retrieves the permissions defined on the specified inventory objects. Get-VIPrivilege Retrieve the privilege groups and items for the provided servers. Get-VIRole Retrieves all roles defined on the provided servers. Get-VMGuestNetworkInterface Retrieves information about the network configuration of the specified virtual machines or guests. Get-VMGuestRoute Retrieves the routing configuration of the specified virtual machines or guests. Get-VMHostAvailableTimeZone Retrieves the time zones available on the specified host. Get-VMHostHba Retrieves information about the available HBAs (Host Bus Adapter). Get-VMHostNetworkAdapter Retrieves the host network adapters on a vSphere server. Get-VMQuestion Retrieves the pending questions for the specified virtual machines. Import-VApp Imports a virtual appliance. Install-VMHostPatch Updates the specified hosts. Move-Template Moves virtual machine templates to another location. New-CustomAttribute Creates a new custom attribute. New-IScsiHbaTarget Creates a new iSCSI HBA target. New-OSCustomizationNicMapping Adds Nic settings mappings to the specified OS customization specifications. New-VApp Creates a new virtual appliance. New-VIPermission Creates new permissions on the specified inventory objects for the provided users and groups in the role. New-VIRole Creates a new role on the specified servers and applies the provided privileges. New-VMGuestRoute Adds a new route to the routing table of the provided virtual machines and guests. Remove-HardDisk Removes the specified virtual hard disks. Remove-IScsiHbaTarget Removes targets from their iSCSI HBAs. Remove-OSCustomizationNicMapping Removes the specified OS customization NIC mappings. Remove-PassthroughDevice Removes the specified pass-through devices. Remove-UsbDevice Removes the specified USB devices from a virtual machine. Remove-VApp Removes virtual appliances from the server. Remove-VIPermission Removes the specified permissions. Remove-VIRole Removes the specified roles. Remove-VMGuestRoute Removes the specified routes from the routing table of their corresponding virtual machines. Restart-VM Restarts the specified virtual machines. Restart-VMHost Restarts the specified hosts. Set-Annotation Changes the name of the specified annotation. Set-CustomAttribute Specifies a name for a custom attribute. Set-IScsiHbaTarget Configures an iSCSI HBA target. Set-NicTeamingPolicy Configures the specified NIC teaming policy. Set-OSCustomizationNicMapping Modifies the provided OS customization NIC mappings. 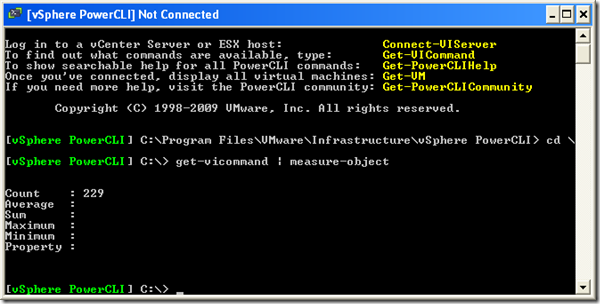 Set-PowerCLIConfiguration Modifies the vSphere PowerCLI configuration. Set-VApp Configures a virtual appliance. Set-VIPermission Modifies the properties of the specified permissions. Set-VIRole Modifies the privileges of the provided roles. Set-VIToolkitConfiguration Modifies the vSphere PowerCLI configuration. Set-VMGuestNetworkInterface Configures the network settings of a virtual machine using VMware Tools. Set-VMGuestRoute Configures the specified route. Set-VMHostHba Configures the CHAP properties of the given iSCSI HBAs. Set-VMHostStorage Configures a host storage. Set-VMQuestion Answers the specified virtual machine question. Start-VMHost Starts the specified hosts. Stop-VMHost Powers off the specified hosts. I want to get the maximum cpu usage of the last 30 days, but nothing happens, only the average numbers occur in the stats.csv. You guys have just made far too many exciting changes, I knew I missed something, thanks for pointing it out. Another important feature is that PowerCLI now supports running cmdlets on multiple servers. To switch between working on a single server and working on multiple servers, use the Set-PowerCLIConfiguration cmdlet.